In my struggles with my weight, I am trying something new when tempted to indulge in a snack or sweets that are not on my plan for the day. I can just look at chocolate and it mysteriously disappears into my mouth. I become the cookie monster when around snickerdoodles. And don’t get me started on peanut butter or ice cream. Pointing and Calling was developed for the Japanese railroad system. This process once implemented reduced errors by 85 percent and accidents by 30 percent. It raised the level of awareness from a nonconscious habit to a more conscious one. Here is an article about this system. The technique is quite simple. Create a ritual where you name the action, point to it and say it aloud. This verbalizes our actions and makes us very aware of what we are doing or about to do. Naming our temptations. 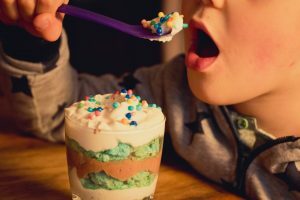 “Cookie,” I say aloud – invites me to pause, wakes me up to my behavior and creates the space for me to not put the sweet in my mouth unconsciously. I am working on this. Naming before eating. My only problem so far is actually remembering to name it first. BUT I am becoming more aware and noticing the frequency of this new healthy habit in the face of temptation is increasing. “Our belief informs our action. What we believe will always direct our next steps. “Doing the next right thing happens one step at a time. So does doing the next wrong thing. self-deception there, and eventually, the rationalizations start to feel justified. 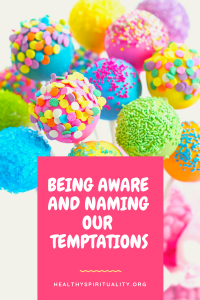 Being aware of my next step whether it is facing a major temptation or simply a bite of a cookie – naming the temptation, pointing to it and saying it aloud – is a preventative tool. What did you give up for Lent? This is a common question this time of year. What did you set for your New Year’s Resolutions? Another question we hear often on January 1, but quickly forgotten by February. How are you growing closer to God? A deep desire with good intentions that many of us hope for but rarely attain. What takes us away from God? Averts our eyes from the Lord? Distracts us from spending time with God. Name the temptation. Whisper its name. Shout it aloud if you must. Awareness is the first step in changing our habits, behaviors, and actions. God will hear us. Help us when facing temptations by surrounding us with his strength, love, and grace. God will always welcome us back even as we fail, which we all will do. Wake up to what will be the next right step. And my next step will be to walk away from the tempting cookie. How about you? Think pointing and calling may work in a world bulging with temptations, distractions, habits, and compulsions? “Spending!” It’s so easy and such a temptation for me to be online and get inspired by what others are making, wearing, buying etc. and it makes me want to follow suit. I’ve been praying for God to help me to be stronger in this (among other) areas. Jean, thanks for the big recommendation as well as the information about “pointing and calling”. I too will be trying the latter when the sweet tooth urge strikes. For Lent, I “gave” up day long screen time and in particular, am limiting my email checks to morning and evening. They all become huge distractors and time wasters. Now I lay out my tasks and focus on them rather than rushing to respond to emails when they come in. Wow! Who would have thought that just naming the temptation before us could have such profound effect? Thank you for adding Emily Freeman’s insights also. We can indeed start small and embrace slow growth. At least we’ll be making progress in the right direction! isn’t this a fascinating idea? Emily Freeman has a great podcast. Her new book comes out next week – can’t wait. You and Steve continue in my prayers! This is a great piece of advice and one that we all can follow. I need to call out to myself, “third cookie” when I’m being tempted to eat yet another. 😉 I have Atomic Habits on my to-read list and look forward to getting to it before too much longer. Thanks, Jean! will be interesting to see how we all apply this. New habits are challenging. Third cookie? Ha, How about the whole box of Girl Scout cookie? ha. What a great idea — as you said, the challenge is remembering to do it, but when we can, I’m sure it’s a powerful practice. You’re the second person this week to recommend Atomic Habits — time to take a look. I’m so glad to know you’ve found Emily Freeman’s podcast. It is wonderful. I am finding as I work on this new habit – it takes time. I promised myself not to give us and slowly, yes very slowly, remembering ahead of time. progress, not perfection. Hope you enjoy the book.